Timepiece and calendar with gold finish. A special moment awaits lovers of classic watchmaking: Carl F. Bucherer presents the Manero MoonPhase from the classic Manero range. The aesthetically pleasing calendar shows not only the current date, day and month, but also the moon phase. All presented in an attractive rose gold case. The special appeal of the Manero MoonPhase lies in its detailed calendar function. A glance at the wrist provides the wearer with a quick overview of the current date, shown by hands around the center of the dial. While the indication of the weekday has been placed at 10 o’clock, the current month can be read off on the right at 2 o’clock. The finishing touch for this special calendar is provided by the moon phase indication, shown centrally at 6 o’clock. The CFB 1966 automatic movement unique to Carl F. Bucherer is at the heart of this extraordinary calendar, making it a reliable companion. The Manero range from Carl F. Bucherer represents the supreme craft of the master watchmaker in its most authentic form. Thus the Manero MoonPhase also reflects elegance and timeless design. With a diameter of 38 mm and a height of 10.85 mm, a classic size for top quality Manufacture watches, the 18 K rose gold case forms a harmonious setting for the silver-colored or black dial with its 12 index marks in the same color. In spite of the many indications of complications, Carl F. Bucherer placed special emphasis on optimum legibility during its design, as can be seen from the wedge-shaped index marks and the tapered Superluminova-coated hours and minutes hands. 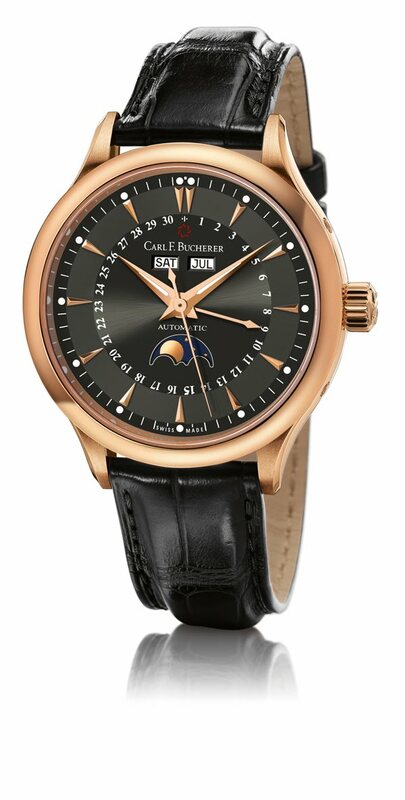 A particularly eye-catching feature is the moon phase indication, which consists of a gold-colored moon disc shining against a blue background. The shimmering effect is continued in the clasp, also made of 18 K rose gold, which is used to close the high quality alligator leather strap, thus underlining the elegant appearance of the timepiece. The look is completed by the polished surfaces of the watch case and the harmoniously rounded strap bars. 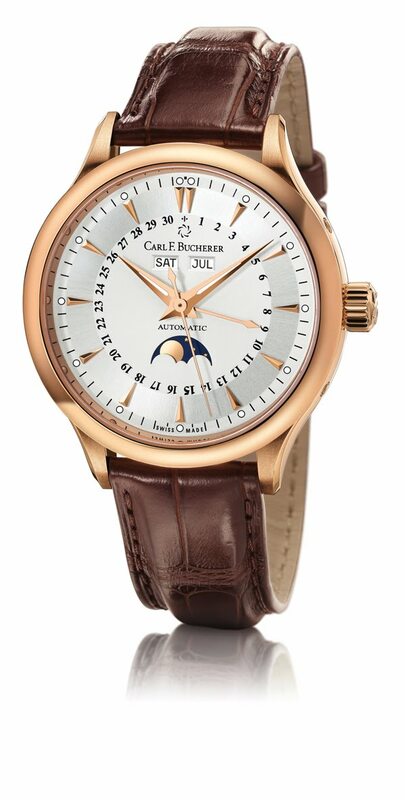 With the Manero MoonPhase, Carl F. Bucherer has created a watch that stands for what the name Manero means. Derived from the Latin “manuaria”, meaning “that which is directed by hand”, it conceals a complex inner life in a simple watch case. And represents a classic and practical expression of the master watchmaker’s craft.